inside co-editor Jan Henderson steps inside the private world of The Australian Ballet and HASSELL’s new interior for the company that raises the ‘barre’ on utility and comfort for dancers and staff alike. Pirouttes, jetés, fouettés and arabesques are wonderful movements of dance that help create the theatre that is a ballet performance. Our very own Australian Ballet, performs regularly at home and abroad and, as one of the best ballet companies in the world, is both cherished and revered. However, the beauty of the ballet performance disguises the hard work, discipline and sacrifice the dancers must make and maintain to create their effortless artistry. There are hours of practice and then the constant problem of injury with rehabilitation and recuperation to be considered, and these are required to be addressed in-house. 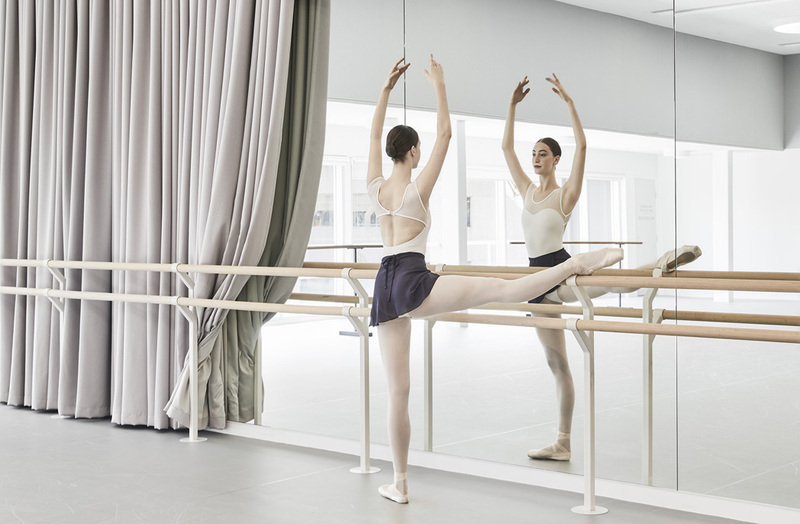 With the completion of the new facilities in Southbank, Melbourne, The Australian Ballet now has a ‘back-of-house’ to match the prowess of the company and the renovation is revolutionary in both design and style. HASSELL was the design practice of choice to redevelop and design the fifth and sixth floors of The Primrose Potter Australian Ballet Centre that houses the company, and the brief was particular. The Australian Ballet was to become more visually integrated within the Arts Precinct and the Arts Centre and there was to be connectivity between the various departments that work within the building. There were challenges to consider, such as ensuring that there were enough facilities for the existing staff with room to grow a little within a fixed space, as well as the 70 configuration of the areas that would allow maximum usability with optimum flow and access. Project architect, Greta Stoutjesdijk, and senior interior designer, Leah Hudson-Smith, from HASSELL designed and managed the commission and have excelled-presenting a new and generous spatial layout and an interior design that is light, adroit and client specific. The start of the journey is at reception, signing in, receiving a lanyard and then stepping through unprepossessing doors into the private world of The Australian Ballet. Throughout the two floors, the colour palette of the interior is clean clear white, a little cream with accents of point shoe satin pink and rich navy blue. With hardly a hint of black in sight, the spaces are light and airy and flow easily from one to another. 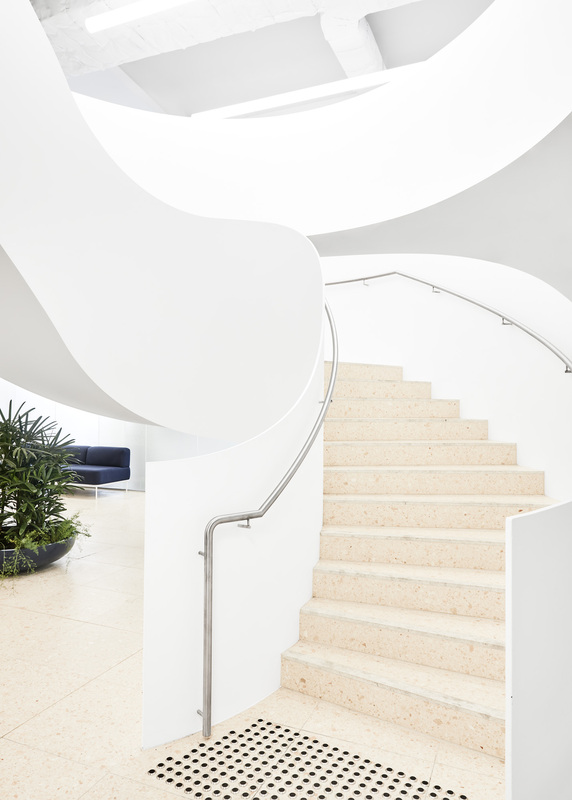 Materiality is hardwearing and user-appropriate with a custom blended honed terrazzo slab (Fibonacci Stone) on the stair and reception desk, tiles in the café, hub and point shoe room, and rubber flooring in the change and rehabilitation rooms (Rephouse). Overhead, some of the existing services of the base building have been left exposed and painted white, while specific areas have a dropped perforated acoustic ceiling treatment. Truncating the fifth and sixth floors is the heart of the design – a circular staircase that has been designed just wide enough for two dancers in tutus to pass each other. This is a small detail, but most important for dancers in costume. The stair itself looks ethereal, white and smooth with a curvaceous ribbon balustrade; however, its apparent fragility belies the strength of the 16-millimetre steel plate form. 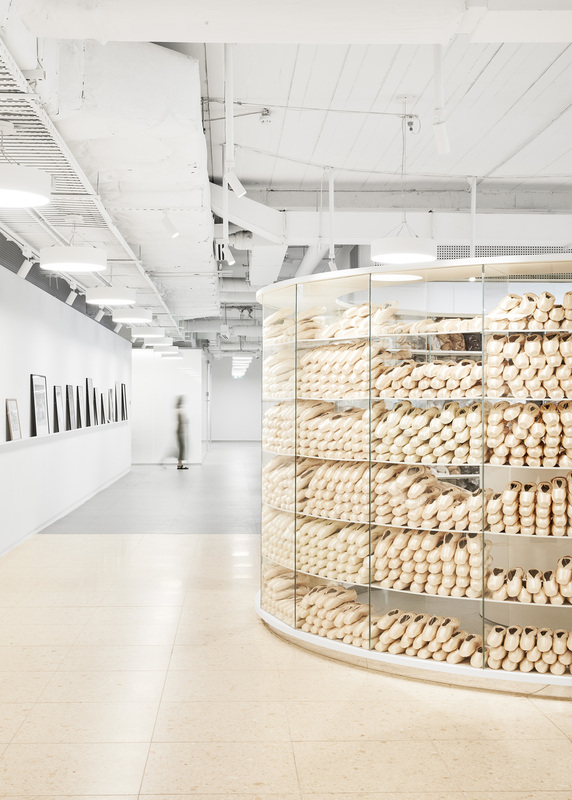 In its own way, and often seen throughout the spaces, there is an outward appearance of softness that disguises core strength, which is a fine metaphor for the ballet itself. On level five is the café and general meeting area. The space is generous and the vistas from the picture windows that frame the trees and the National Gallery of Victoria outside ensure that The Australian Ballet is certainly part of the Arts Precinct. Furniture includes a curved modular lounge in blue velvet (Softscape, Stylecraft and Oxford, Instyle), upholstered armchairs with white painted base and dark blue fabric (Duna, Arper, Stylecraft and Extreme, Instyle) and white painted hardwood round tables (Life Space Journey and District). 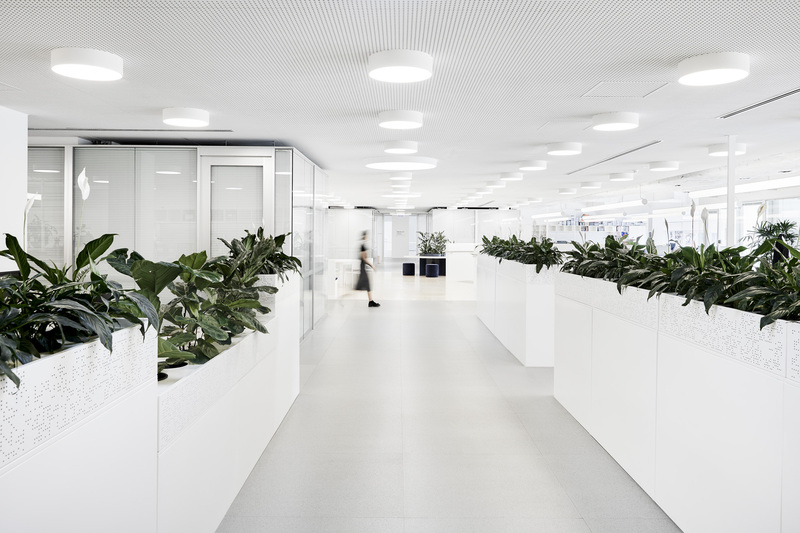 To the side of the café is the circular glass-walled point shoe room and further along are the administration and medical rooms with walls of frosted glass (Lumina Cloud, Viridian) for privacy. Light is reflected through these glass walls and helps to create a bright environment. 74 Along one side is the boardroom with custom table (Alle, District) and white chairs on casters (Charlie, Something Beginning With), rehabilitation and physiotherapy rooms, gym and medical offices, with a recovery room and doctors’ consulting rooms opposite. Every area has been devised for maximum usage with state-of-the-art equipment and there are framed window views to bring the outside in. 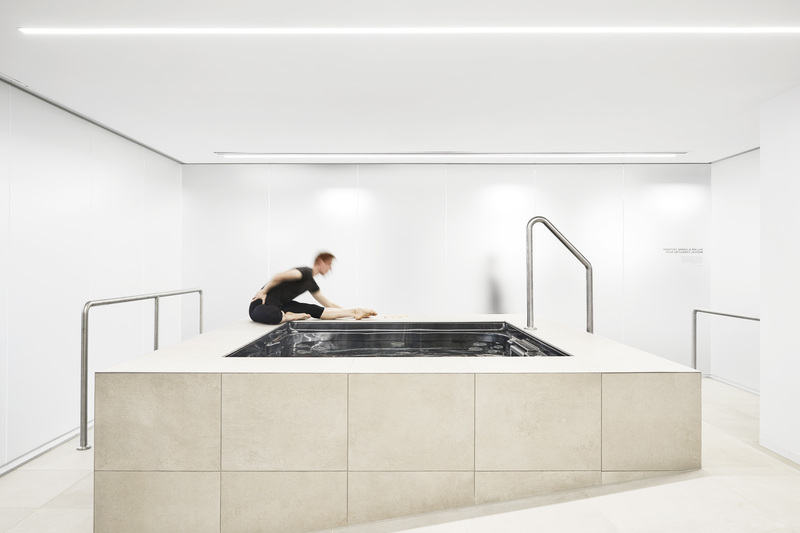 One of the most impressive areas is the world- class recovery room with a monolithic above ground square spa bath for dancers to ‘ice down’. The water is kept at a constant eight degrees to help aid recovery from injury and there is also an area for dispensing ice, so that packs can be tailor-made for application to specific areas of a body. Behind the recovery room is the very private dancers’ common room. No administration staff can venture into this hallowed area and dancers can relax, heat up a meal or work on computers. Beyond the common room are the male and female change rooms and here it is obvious that HASSELL has done its homework. Designing for a ballet company is very particular and this client has unusual needs. 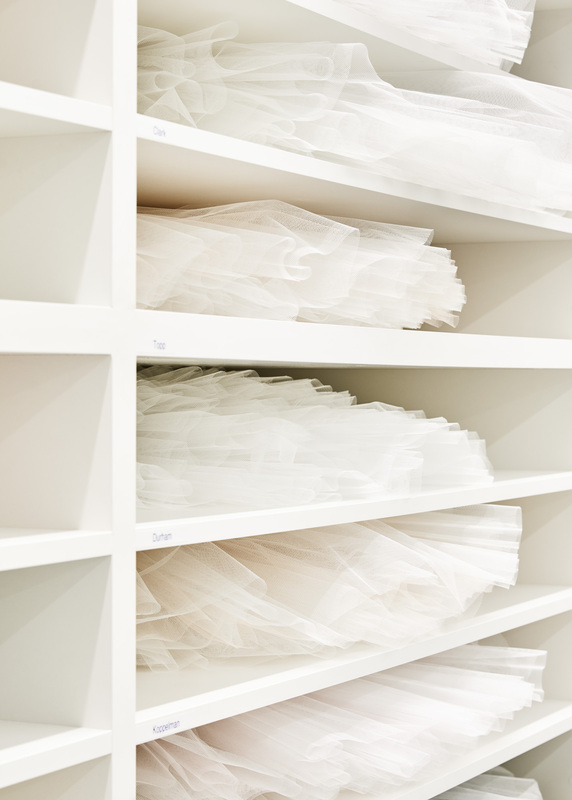 For example, there is a large horizontal shelving unit for storing short ‘classical’ tutus so they are not crushed, an area with hooks for long ‘romantic’ tutus, a laundry with a specific area to cut and sew ribbon and paint shellac on point shoes (a messy necessity to extend the life and strength of the customised shoes), showers and toilets with lockers enough for a future capacity of 85. The men’s area is just as detailed, with areas to wash and dry t-shirts (many danseurs will use up to five or six t-shirts in a day, such is the physicality of their work). 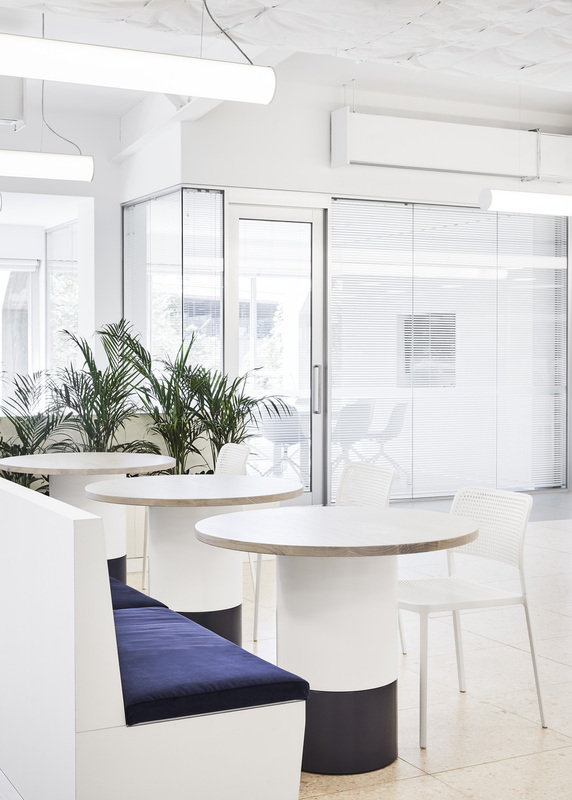 Moving up to the sixth floor is the semi open plan administration area where a hub kitchen has been centrally placed to promote staff interaction for informal meetings or lunch. On one side are the multiple workstations (Schiavello) for administration and marketing staff; on the other, are private offices for senior staff of The Ballet. There are multiple meeting rooms, two of which sit side-by- side and have been dubbed ‘Odette’ and ‘Odile’ in recognition of the good and bad swans from the ballet Swan Lake (it is rumoured that Odette, the good swan, is generally more favoured for meetings). Multiple rooms have been placed behind the public space for the Music Department with a designated area for storing scores. Beyond is a small air-locked room with upright piano and it is here that music is played and scores discussed without disturbing other staff. At the very end of this area is the beautiful new double-sized dance studio. As with everything in this project the studio is custom-made with sprung flooring (Harlequin) that has been marked up to duplicate the stage of the State Theatre where the Company performs. There are bespoke barres, walls of mirrors, acres of curtaining (Twilight, Kvadrat) and natural light, which is plentiful through the inclusion of 12 circular skylights. The dance studio can also be divided into two with an operable wall (Hufcor upholstered in Heritage, Kvadrat) that can be pulled across the middle to create two smaller studios. In all, the facilities of The Australian Ballet are now world-class and the project a credit to the Company and those who guide it. HASSELL as architect and designer of the project has thought of every detail, customising the interior for perfect use. 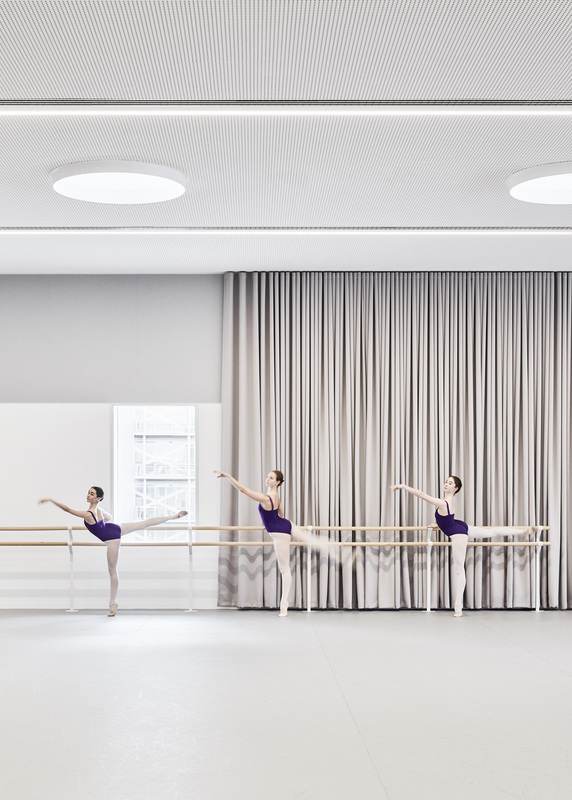 The HASSELL team listened to their client, understood their needs and requirements, and have translated the brief into an interior that is now truly worthy of our national ballet company and the ballet is richer for it. I would be interested in the dropped acoustic ceiling solution and what method for noise insulation has been employed here?